MS Roald Amundsen provides unique nature based experiences and exceptional expedition cruises whilst taking care to consider the environment in which she sails. Possessing new hybrid technology designed by Rolls Royce, MS Roald Amundsen has been built to be more sustainable, silent and environmentally friendly. 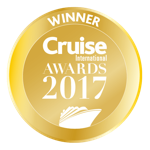 An effective use of electricity onboard reduces fuel consumption and CO2 emissions, making a cruise with MS Roald Amundsen a great choice for conscious cruisers. Life onboard is comfortable and focussed on enhancing the incredible destination rich cruising experience that Hurtigruten are known for. Panoramic windows provide sensational viewing points and the resident Expedition Team are on hand hosting talks and lectures relative to itinerary highlights. A comfortable range of outside cabins and suites are available to book onboard MS Roald Amundsen, all coming with a TV as standard. Tea and coffee making facilities can be enjoyed in the Arctic Superior class cabins and for a touch of luxury the Expedition Suites include bathrobes. Some suites also include a private outside Jacuzzi.